WINTERSTEIGER. A Global Player. 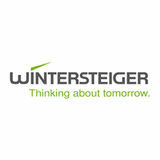 WINTERSTEIGER AG is an international machinery and plant engineering group. Founded in 1953, it has graduallyestablished itself as a leading provider of innovative solutions for customers in technically sophisticated niche markets. A successful and attractive employer. Modern workplaces with communication zones create the perfect atmosphere. We find the right solutions every day. A range of social benefits. You don‘t stumble across a good working environment by accident. Often, it‘s the little things that really boost morale. These are the benefits we have to offer – alongside a salary, of course. In-house employee restaurant with varying lunch menus (always including a vegetarian option). Various sporting activities as well as presentations on promoting a healthy lifestyle. WINTERSTEIGER employees receive a subsidy for lunch. Discounted membership to a local gym. Hot and cold snacks, as well as sweet items, are available in the restaurant and from vending machines. We‘ll help you get your vitamins with our readily available fresh fruit. Available regularly for consultations and there to provide vaccinations and workplace evaluations. Drinks Coffee, tea, and cold drinks are available in the employee restaurant, from the vending machines, and in the coffee room. We offer rapid support and arrange free therapy sessions where necessary. Work-life balance. Employee events Regular company parties (e.g., summer party, Christmas party, celebrations for completed projects), the annual ski trip, and traditional company sports activities to promote great team spirit. Fun-Corner Company sports competitions in four disciplines with great prizes for the winners, as well as numerous meeting areas in company premises. Educational leave/career breaks It is possible to take a leave of absence to pursue further education opportunities or a career break/ sabbatical during an existing period of employment. Flexible working hours for both clerical and manual workers. Working from home Our official working from home guidelines give you the opportunity to work from home. Dependent on position. We also offer pool cars for business trips. Use of various services or reduced rates and discounts through our partners. Company cell phones that may also be used as personal phones. Many of our employees work on company laptops, which may also be used for non-work-related activities. Accessibility Our offices are designed to be as accessible as possible – structural changes are made whenever necessary. 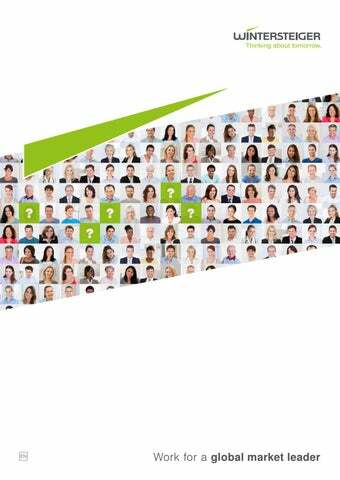 Individual training schedules and support provided by specific colleagues or the whole team. Parking available directly in front of the company premises or areas around the site. Only a few minutes‘ walk from the train station and bus stops. Training and professional development Induction phase including training schedule, annual performance review where personal training measures are agreed, WINTERSTEIGER talent management program to promote specialist and management careers, company-specific sales academy, as well as opportunities for experiences abroad in subsidiary offices. Performance-based reward scheme, as well as employee bonuses (e.g., for recommending new employees or for successfully completing projects). Supplementary insurance Collective accident insurance for business trips, as well as discounted supplementary health insurance through our partner. WINTERSTEIGER social fund We have founded our own charity to support employees and their relatives in difficult personal situations. We offer loans at favorable rates of interest to our employees. Vehicle allowance Our apprentices receive a free annual “JugendticketNetz” card, which is valid on all OÖVV transport routes. Employee gifts Free ski grinding day, Christmas gifts, gifts for special occasions (e.g., weddings or birth of children), as well as an above-average birthday bonus. 11 USA: WINTERSTEIGER Inc., Salt Lake City 12 Brazil: WINTERSTEIGER South America Ltda, Palhoa Willkommen bei WINTERSTEIGER Version 04/2019, Print 04/2019. Fotos: Resch, WINTERSTEIGER. 1 Austria: WINTERSTEIGER AG, Ried i.I.